Description Digital scan of a postal card. 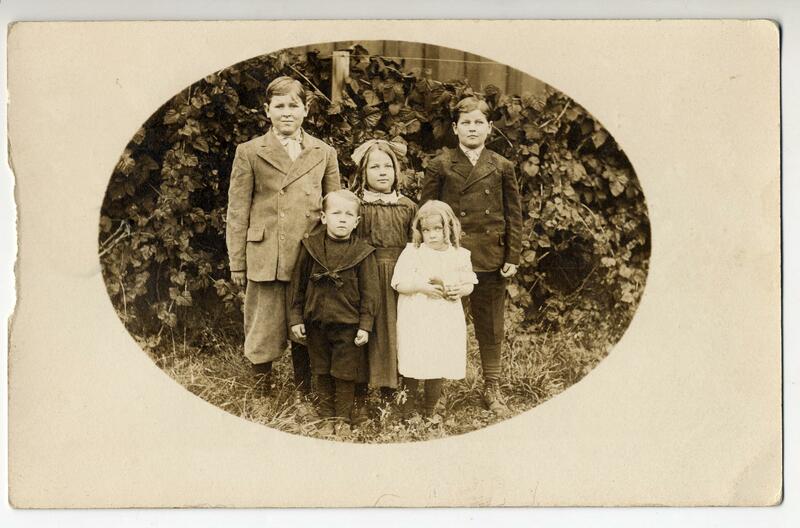 Information provided by family: Back left is Clarence (born 1897;) back right is Harold; bottom: Herbert, Violette, and Lona. This is at the old house still (Sept. 2008) on Carman Dr. & Kruse Way; perhaps 4620 SW Carman.) On back of original:[Typed on back:] Help us! We are coming-the rulers of your lands -All yours are ours - your thoughts, your gold, your hands! Oh ne'er forgotten childhood! 'Neath sunny summer skies, When hopes like blooms on wildwood, In our bosoms form and rise, When rapturous thoughts come flowing, With the stillness of a stream, And life itself now knowing That bliss is but a dream; When our eyes with radiance glowing, May search the starry skies, And view a dipper there o'erflowing, With visions of Paradise.